A playlist is a collection of videos that are grouped together in a particular order for playback in a player. 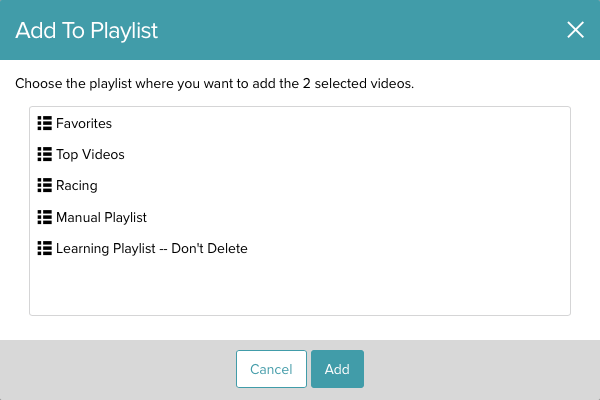 The Media module makes it easy to create playlists and add videos to a playlist. After you've created your playlist, you can publish a playlist to a player. For more information on publishing playlists, see Publishing Videos and Playlists with the Media Module. For more information about playlists, including best practices and tips for using them effectively, see Introduction to Playlists. Manual - With a manual playlist, you assign specific videos to the playlist and re-order them manually. Smart - With a smart playlist, the list of videos in the playlist is constructed automatically, based on video tags or other video properties. 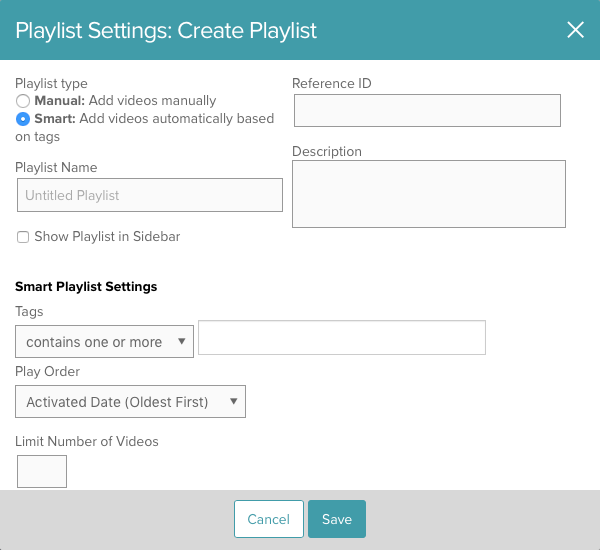 Smart playlists are dynamic and automatically update based upon the videos in your media library and the rules that define the playlist. Manual Playlists - Videos are loaded into the playlist based upon the order of the videos in the manual playlist. 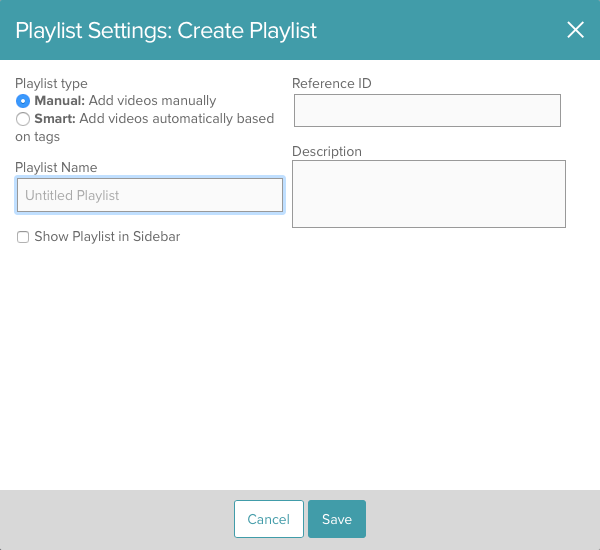 Smart Playlists - Videos are loaded into the playlist based upon the Play Order playlist setting. For information on programmatically retrieving additional videos into a playlist, see the Playback API Paging player sample. In the side navigation panel, click Create Playlist. The New Playlist dialog will open. Note: You can hide or show the side navigation panel by clicking the side navigation button . Select the playlist type, Manual or Smart. Enter a Playlist Name using the following guidelines. (Optional). Enter a Reference ID and Description. Check Show Playlist in Sidebar to have the playlist appear in the sidebar. Note: A maximum of 100 playlists can appear in the sidebar. If you are creating a Smart playlist, the following settings can also be configured. In the tags text field, enter one or more tags (separated by commas) that will be used to define the playlist. Play Order - Controls the order in which videos in the playlist are played. The following options are available. Start Date (Oldest First) Based on the date the video was scheduled to start, oldest videos first. If a video does not have a start date specified, then it will not appear in a playlist ordered by start date. Note: Video scheduling is available only to Video Cloud Pro or Enterprise accounts. Start Date (Newest First) Based on the date the video was scheduled to start, newest videos first. If a video does not have a start date specified, then it will not appear in a playlist ordered by start date. Note: Video scheduling is available only to Video Cloud Pro or Enterprise accounts. Limit Number of Videos - Enter the maximum number of videos that should be in the playlist. Check the boxes next to the videos that should be added to the playlist. Click the Add to Playlist button at the top of the page. Select the playlist to add the videos to. Click Add. Videos added to a manual playlist will be added to the top of the playlist. To change the order of the videos in a playlist, follow the steps based upon the type of playlist you are working with. Click All Playlists in the side navigation panel, locate the playlist and click the playlist name link. The list of videos in the playlist will appear. Click on a video and drag it to its new location in the order. Note: You can also change the video order by editing the Play Order field. Re-ordering by drag and drop does not work in IE11 or Edge, but you can re-order the items by editing the numbers in the Play Order field. If the playlist is displayed in the sidebar, click on the playlist and then click the down arrow next to the playlist and click Edit Settings. If the playlist is not displayed in the sidebar, click the All Playlists heading in the side navigation, locate the playlist and click the playlist name link and then click Edit Settings. Select a new Play Order for the playlist. Smart playlists are created dynamically when the player is loaded from the available video information and so the order should always reflect current state. However, the player always gets its info via the Playback API, which uses data cached for up to 20 min. Playlists may take that long to refresh and may be behind what the CMS API would show. Edit the playlist settings and then click Save. Note that you may not convert a manual playlist to a smart playlist or vice-versa. If the playlist is displayed in the side navigation panel, you can click on the playlist and then click the down arrow next to the playlist and click Edit Settings. Click All Playlists to display a list of all the playlists. Click the checkbox next to the playlist to delete. If the playlist is displayed in the side navigation panel, you can click on the playlist and then click the down arrow next to the playlist and click Delete. Click the checkbox next to the video(s) to delete. You can also remove a video from a manual playlist by editing the video properties. In the Video Information section, delete the playlist ID from the Manual Playlists section.